Valerie Childress with one of her four graduates at Hybrid High, Cambria Kelley. The first class to graduate from an innovative university-based charter school in Los Angeles is sending all 84 grads to four-year colleges, most with scholarships. 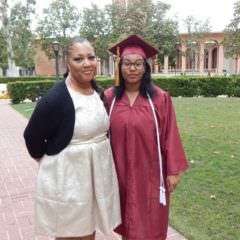 Valerie Childress watched her quadruplets graduate Saturday evening on the campus of the University of Southern California with tears in her eyes. 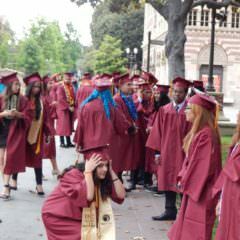 The Childress quads are part of the first graduating class of USC Hybrid High School, an LA Unified charter school operated by Ednovate, which focuses on personalized learning. The students landed more than $5 million in scholarships and 400 acceptances from schools such as University of Pennsylvania, UC Riverside, Pepperdine, Cal State LA, California Institute of the Arts, UCLA and, yes, six to USC, which sponsors Ednovate. The school, near downtown and on the first floor of the old Los Angeles World Trade Center, is 74 percent Latino, 22 percent black and 85 percent in lower socio-economic families. All of the graduates have completed graduate prep courses, 10 percent are “DREAMer” immigrants and 85 percent are first-generation college students in their families. USC Hybrid High School is unique because it is a personalized college prep school where everyone has a Chromebook and teachers monitor each student’s performance every step of the way. The students learn to be self-directed and self-motivated in the schoolwork. Ednovate has two schools in LA Unified, USC Hybrid High and USC East College Prep, which opened in Lincoln Heights this year. It will open another school in Santa Ana in Orange County in August, and two other schools have been approved to open in LA Unified in 2017. 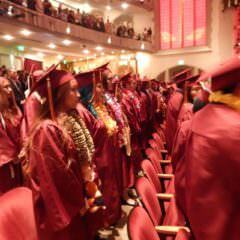 Hybrid High seniors graduate on the USC campus. “When I graduated here from USC there weren’t that many charter schools in the country,” said Ednovate President Oliver Sicat before the ceremonies. “The idea that I can start a charter or create a high school was not available to me at the time,” Sicat said, but he knew he wanted to intersect entrepreneurship with education, and that’s what he’s doing now with the help of his former alma mater. One of their students was homeless when she enrolled as a freshman and entered through the foster program. “She worked through some really tough conditions to transition to college prep and is now going to a four-year college on scholarship,” Sicat said. Another student acted out by tagging bathrooms and skipping classes when they asked why he wasn’t doing his homework. He said that everyone in his family was either in auto mechanics, on drugs or in a gang. He wanted an option out of it to break the cycle. 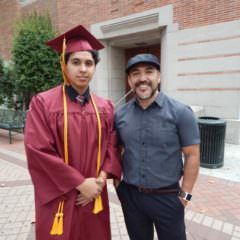 Tristian and Raymundo Corona at the Hybrid High graduation ceremony. Tristian Corona, 18, is the oldest of seven children in his family and now has a scholarship to UC Merced where he wants to major in mechanical engineering. “The teachers here really helped create a pathway for me and inspired me,” he said. Class president Vanessa Ruiz translated the opening speech into Spanish for the mostly Latino audience. 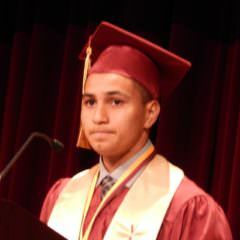 Another student speaker at the graduation ceremony was class valedictorian Juan Castro, who landed a full scholarship to the University of Pennsylvania. He encouraged his fellow students to remember all the firsts in their school: first prom, first senior camp, first graduating class, and their principal, Mide “Mac” Macauley, who provided all of them motivation. Juan Castro landed a scholarship to the University of Pennsylvania. Cambria has a scholarship to UC Riverside. She plans to study creative writing. *This article has been updated to correct that Oliver Sicat graduated from USC but not from its school of education, and to correct the number of schools Ednovate now operates.